Historic victory on Net Neutrality! In February 2015, the Federal Communications Commission voted 3 to 2 to reclassify broadband as a utility -- and ban slow lanes on the Internet! 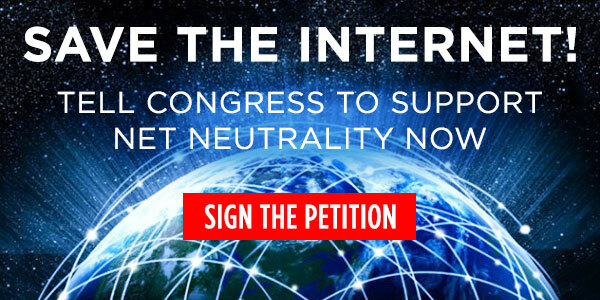 This vote would never have happened without the relentless actions of Democracy for America members like you and Net Neutrality-driven advocates like Fight for the Future, Demand Progress, Free Press, CREDO Mobile, Color of Change, PCCC, MoveOn and a seemingly infinite army of diverse organizations that would take the length of this email to mention. Reclassifying broadband wasn't even on FCC Chairman Tom Wheeler's radar as recently as 9 months ago. As the Huffington Post just reported, "a few months ago, such rules were considered a pipe dream of net neutrality advocates." But together with our allies across the country, we got to work building the case that reclassifying broadband was the only way to truly protect the free and open Internet in the short term and for the future. Our opponents will not be able to overturn reclassification in the short term. But this is NOT over -- not by a long shot. Republicans in Congress, fueled by their Big Telecom buddies, are going to try to find ways to reverse this win. Their first step: Drag the FCC members into an oversight hearing to grill them on their "overreach" in an attempt to turn the public against Net Neutrality. We've won the short game. Now help us gear up to win the long game, too.